I want to talk to you about going to Las Vegas with kids. 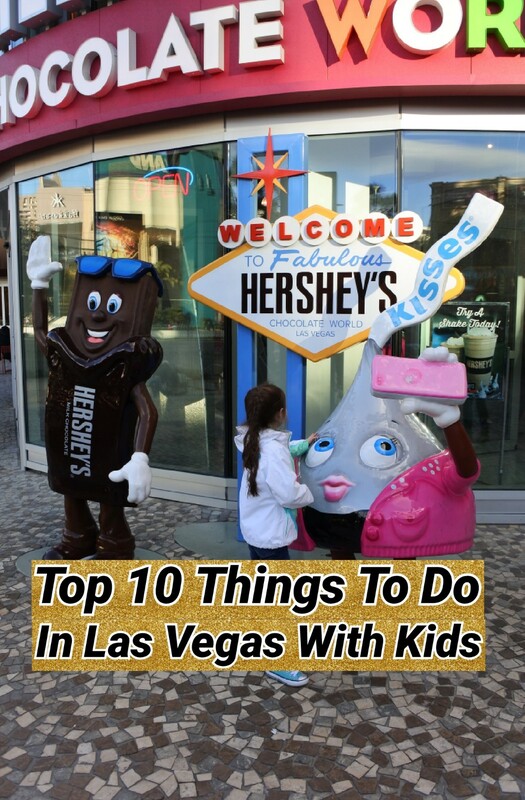 Although it seems far removed from the family friendly Vegas of the 1990s there are still plenty of fun things to do as a family. I speak from experience. 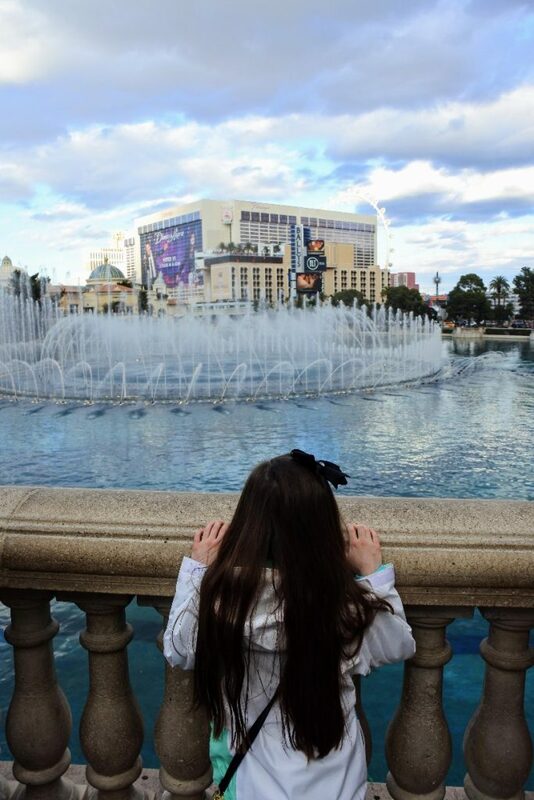 I brought my 8-year-old daughter Elizabeth to Las Vegas twice in 8 months. The first time was a two-night stop during our epic girls’ road trip. The second was a last minute family trip for three nights over winter break. 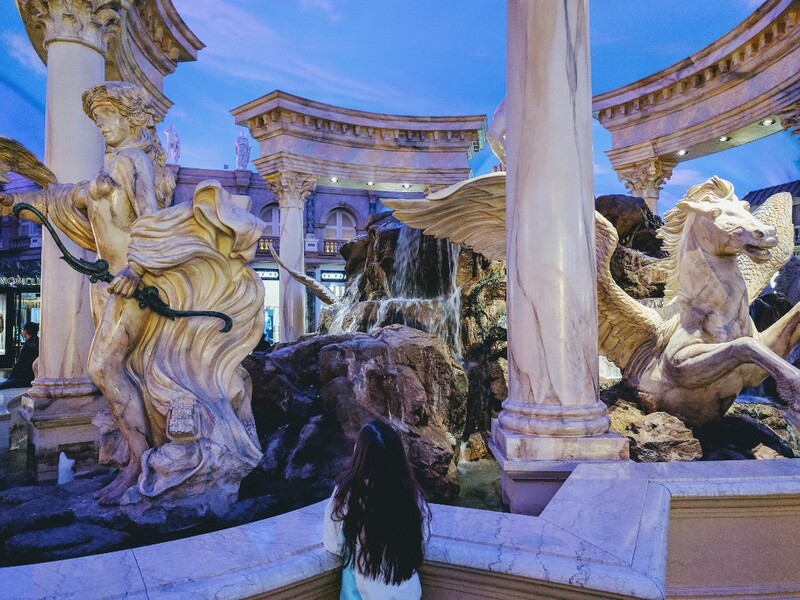 In those two trips we explored the following places both on and off the Las Vegas Strip. This article will give you the scoop on Las Vegas Boulevard a.k.a. The Strip. To see what we did off Strip check out this article. What better way to start your adventure than with a picture in front of this iconic sign? There is a free parking lot available at this popular tourist stop. The only caveat is that you see the sign driving north on Las Vegas Boulevard but must enter the lot driving south. We overshot the sign, made a U-turn, and went back to the lot on our most recent trip. This is probably my favorite resort in Las Vegas. The Bellagio Conservatory is a large room decked out in flowers and different themes throughout the year. Elizabeth really enjoyed looking at the decorations in here. 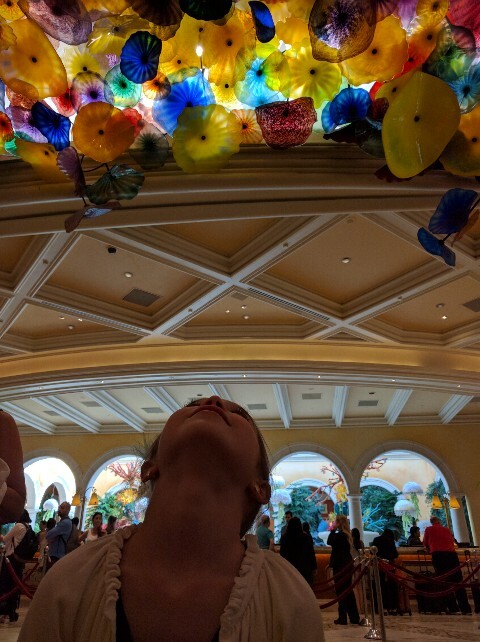 The lobby has a stunning Chihuly glass flower ceiling. 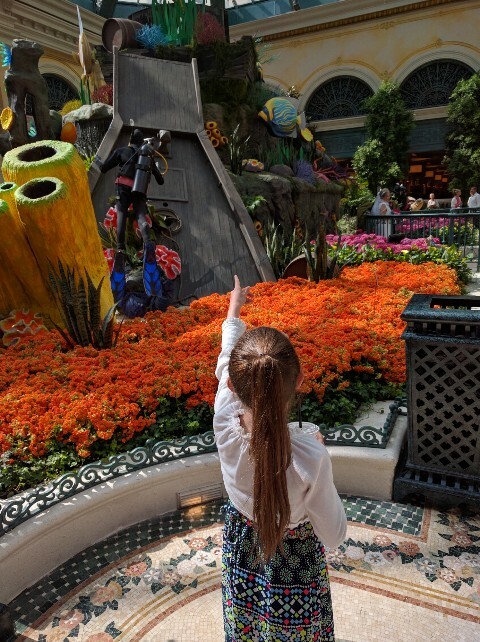 The Fountains of Bellagio are a great kid friendly activity. The water cannons shoot out perfectly synchronized bursts of water in time to music. To me, the Fountains at Bellagio are an iconic Las Vegas experience. 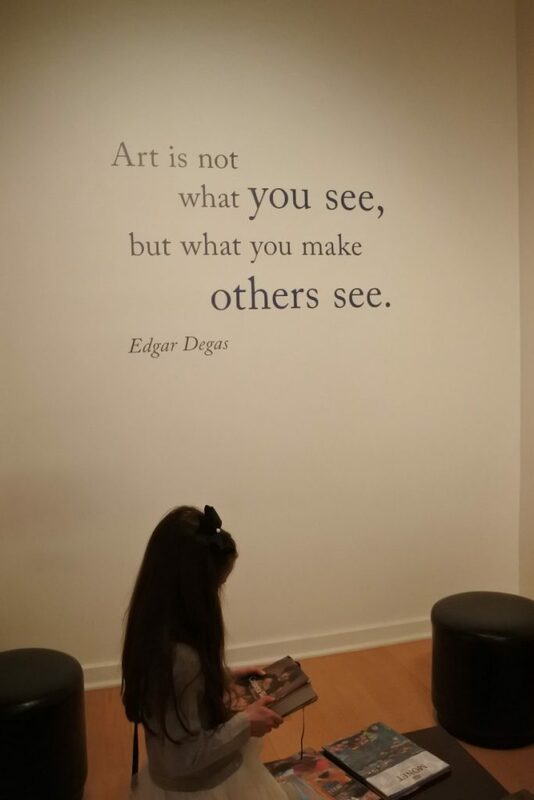 If you have a young art aficionado, add the Bellagio Gallery of Fine Art to your itinerary. Admission is free for those kids 12 years and younger; others are $17 each. I recommend going on the docent led tour. It is given once a day (2pm during our visit), and you have an expert who will walk you through the exhibit for no additional cost. We learned a lot from our docent who taught us so much about the exhibits in the two-room gallery and the techniques used by the artists. 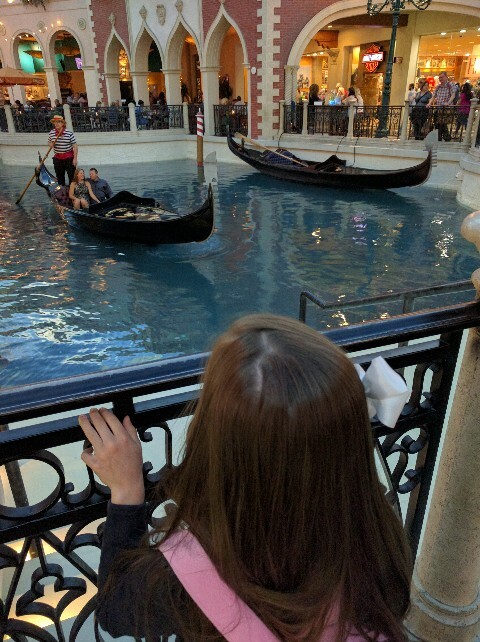 The Grand Canal Shoppes are a great place to explore with kids. Where other than Las Vegas could you see gondoliers pilot boats on an indoor canal while singing? It is free to watch the gondolier performances, but if you would like to be on the boat that can be arranged for a price. At night the giant volcano in front of the resort “erupts.” It is a fun (and free) show that runs about twice per night. Check the Mirage website to find out exact times. There is also a large aquarium behind the Mirage check-in desk where you can look for Nemo and friends. For a change of pace the Linq is actually located outside. At least the shops and restaurants are outside (the hotel is inside of course). Also located in this area is the High Roller. 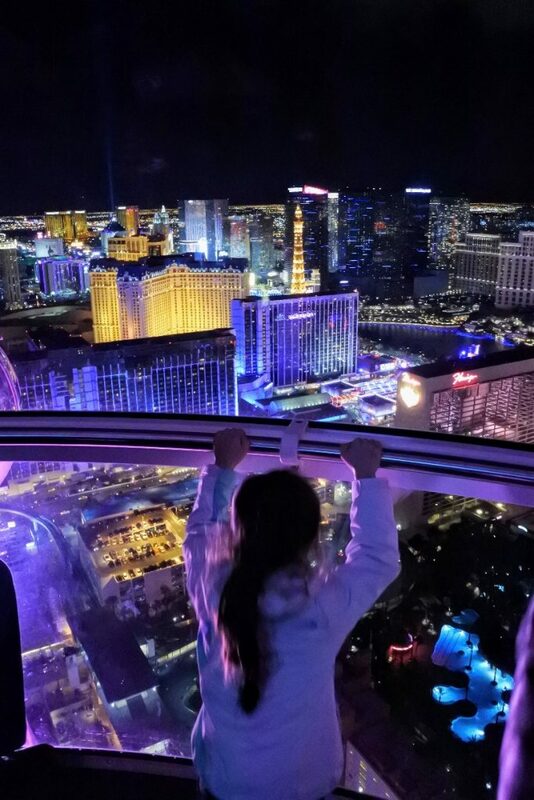 The High Roller is a 550-foot, enclosed-cabin giant Ferris wheel that provides great views of The Strip day and night. Tickets can be purchased at time of riding for full price or bought online ahead of time at a discounted price. 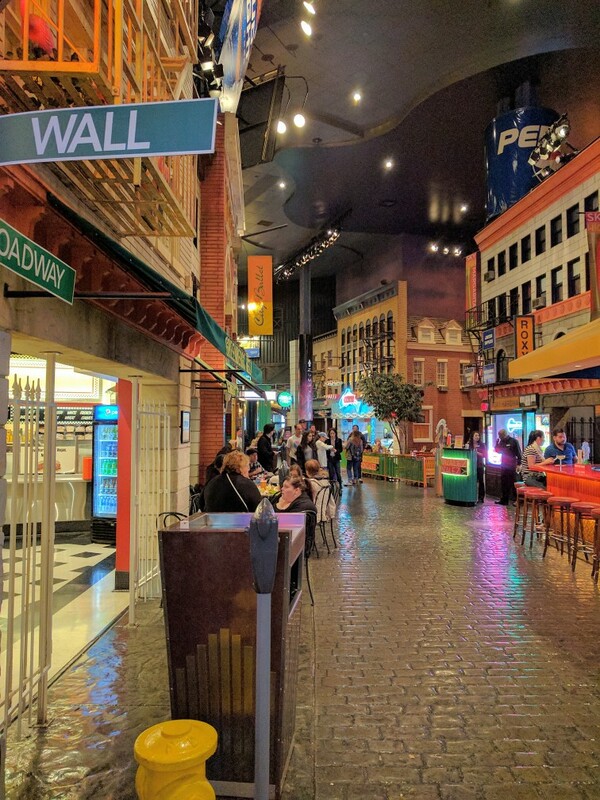 and a food court inside that looks like you are on the streets of New York can be found at this resort. 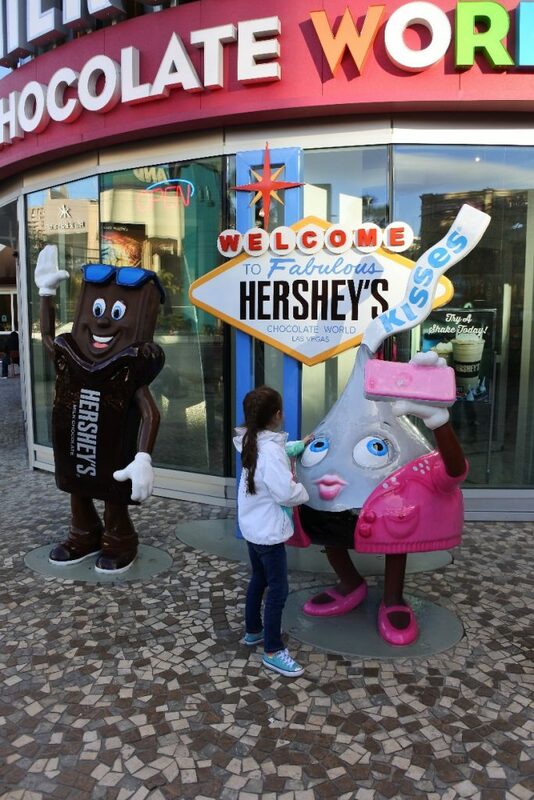 There is also a huge Hershey’s store with a chocolate Statue of Liberty and a roller coaster for those daredevils 54 inches or taller. Disclaimer: Zumanity (the adult-only Cirque du Soleil show) resides here and advertising is prevalent. Check out ads online ahead of time to evaluate your own comfort level with images. 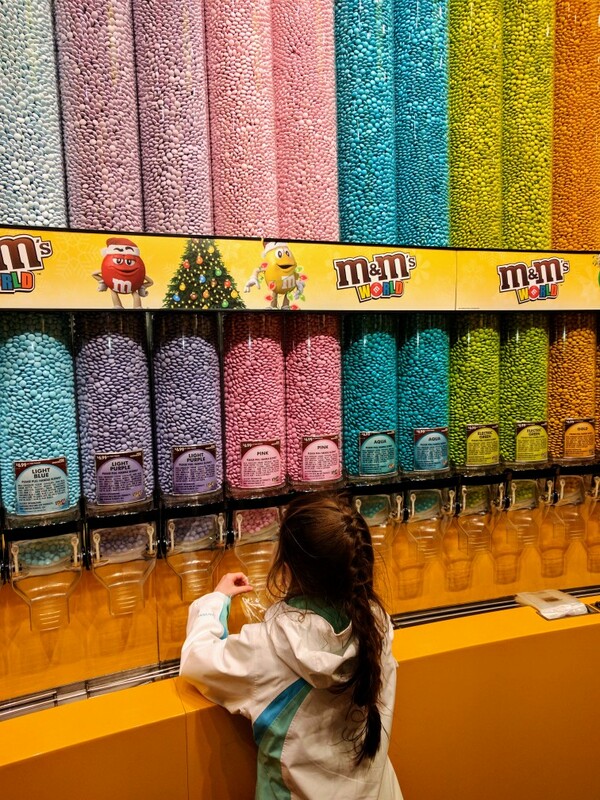 Four floors of M&M merchandise and a wall of pick your own M&M colors by the bag. Need I say more? Both were full of action, and none of us took our eyes off the stage the entire time. 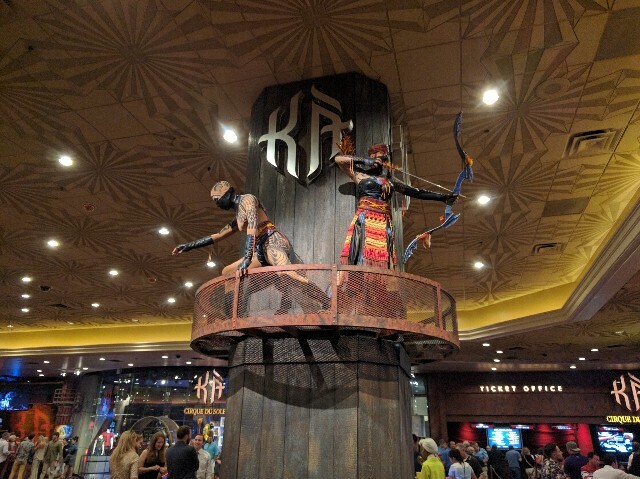 I cannot explain to you the magic of Cirque du Soleil – you really need to experience it for yourself. Based on the research I did, this looks like a cool aquarium located inside the Mandalay Bay property. Unfortunately, we ran out of time and didn’t get to check it out ourselves. Some of the nicest hotel pools can be found in Las Vegas. 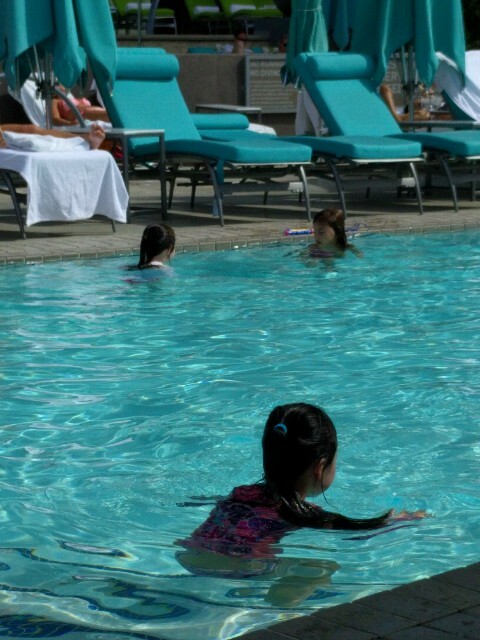 We had a great experience at the Vdara pool over the summer when we went from 9am until 12pm. Many resorts have more than one pool so check out which one is best for you and your family during your trip. 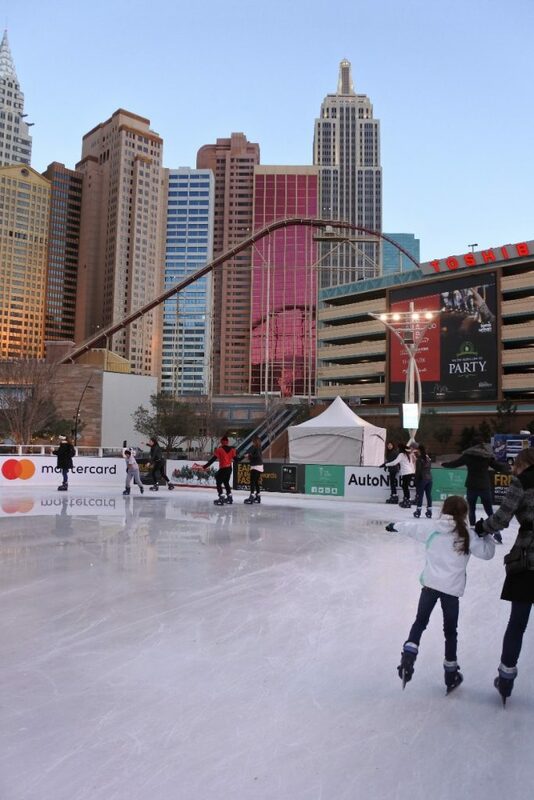 If you find yourself in Las Vegas with your family in December into very early January you can rent ice skates and glide around a rink behind New York New York in the area known as The Park. Coming from a cold weather climate as I do, I thoroughly loved ice skating in the balmy 58-degree day. 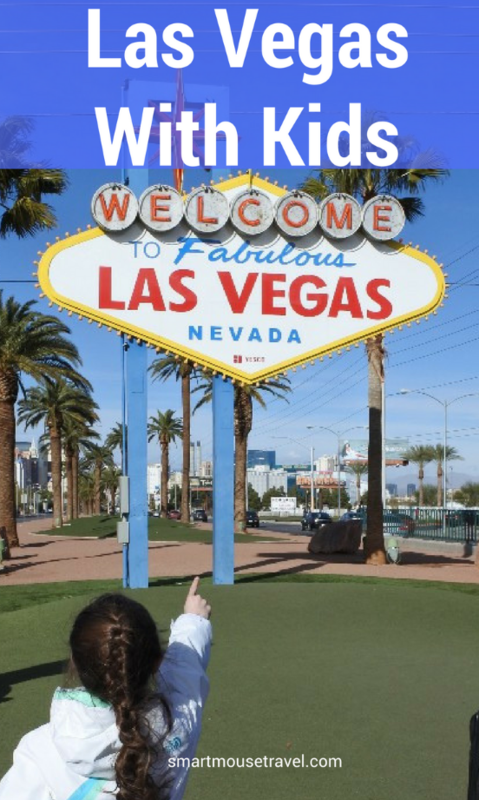 Did I convince you that Las Vegas may actually be a fun place for a family trip? 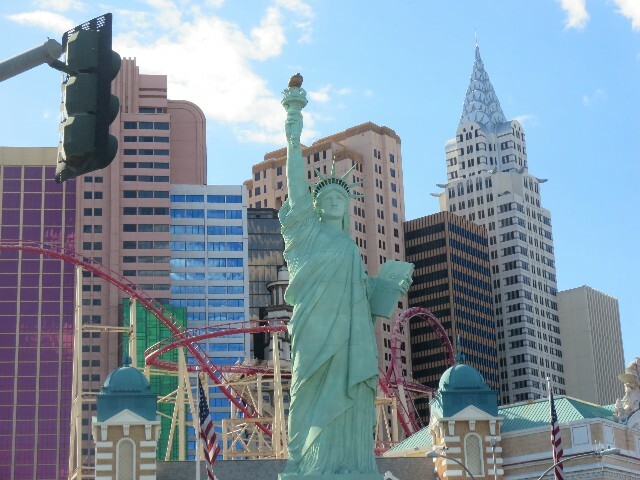 If you are still unsure, check out my next article showcasing all the fun stuff we did off the Las Vegas Strip. I think you could have a great time! We can’t wait to take our daughter to NYC. I’m glad to hear you had a fun time visiting Las Vegas with a small child. It really does have a lot to offer families if you know where to look. I ask my kids , where do you want to go? Answer is always Vegas…. 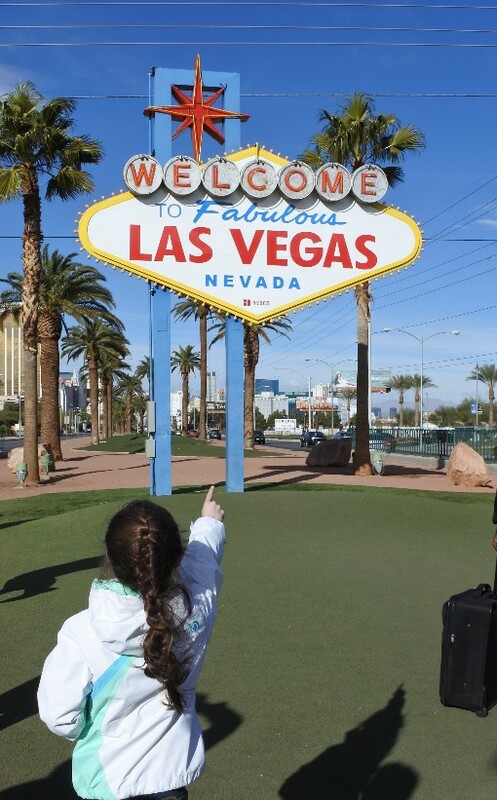 We visit Vegas at least 3 times a year … home away from home? I have been considering taking my 9 year old, but people have reacted quite negat8 saying it is too sexually influenced. There are certainly plenty of questionable images in Las Vegas which is why we avoid walking Las Vegas Boulevard (The Strip) and certain hotels that have more risque clubs or shows. 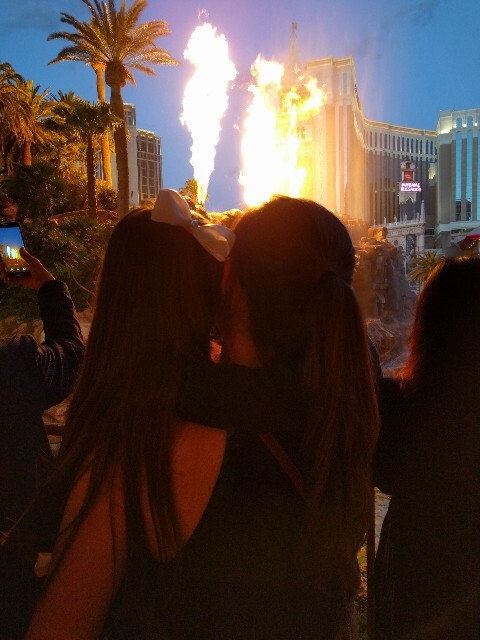 We have found that if we visit more luxury focused resorts and unique off-strip options that we can have a lot of fun without subjecting our daughter to age inappropriate experiences. 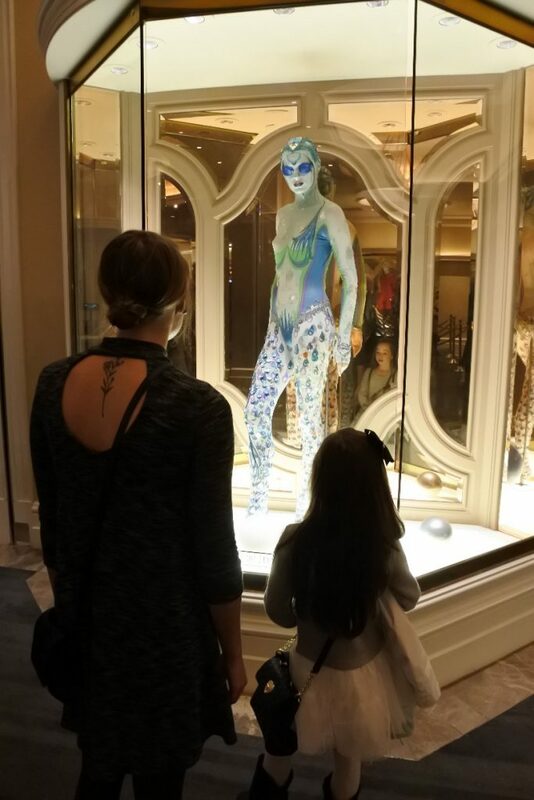 Avoiding weekends and late nights also helps to keep the Las Vegas experience more family friendly.